Leading Chinese brand Oppo has confirmed that their mobile phone has successfully completed 5G Internet access for the first time. In the research and development of 5G, Oppo has once again taken the lead in the industry and has laid a solid foundation for commercially launching 5G smartphones in 2019. 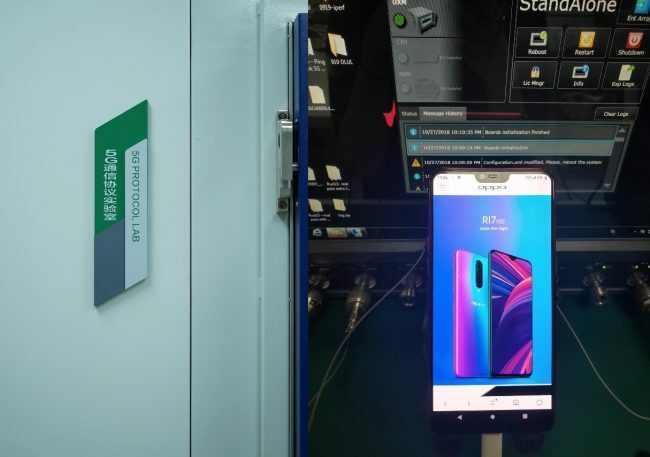 Brain Shen, Oppo Global Vice President and President of China Business Department, has posted on Weibo how Oppo has made the connection successfully between an R15 smartphone terminal and the 5G network, in their 5G communication protocol laboratory environment. The connection was carried out on a pre-commercially available 5G smartphone developed on the basis of Oppo R15. It was customized with fully integrated 5G components including System board, RF, RFFE and antenna. The “5G” logo also appeared in the top right corner of the screen. Recently at the Beijing 2018 Qualcomm China Technology and Cooperation Summit, Oppo announced the partnership with the Qualcomm Technologies’, also known as “5G Pilot” program to jointly explore mobile technology innovations in the 5G network. After then, the Oppo Research Institute was unveiled to comprehensively enhance the company’s technological innovation and research capabilities. Started with the participation of the 5G standard project in 2015, Oppo kept solidly growing in 5G research and development. Contributing to the freezing of the international 5G standard, Oppo also took the lead in the development of 5G mobile phones and also explored what the 5G mobile phone can do. International standards organization 3GPP stated that Oppo ranked first in the number of documents submitted by a global tech company. Also, OPPO began to explore 5G applications, including 3D vision and ambient intelligence. In May 2018, OPPO announced the successful implementation of the world’s first 5G video call demonstration using 3D structured light technology.